View of Our cocktails and Los Angeles from the Soho balcony. They have a strict “no photography rule” which She broke stealthy to get this shot. He was less than stealthy playing with the video camera on His new iPhone and was politely scolded. We had been curious about the Soho House since it opened a few months ago, though not curious enough to drop the $2000 (apiece) annual membership fee required to gain entrance. So when She received an email announcing a private LACMA event (We do not, however, mind paying these annual fees. Support the arts, people.) being held at the Soho House, We jumped at the opportunity. We arrived and got a bit lost in the Soho House, but the first thing We were able to find was the bar. Before We would go searching for the event, We decided to have a cocktail; She a Tequila Daisy and He a Hendricks on the rocks. The Soho House has a nice art collection (including LA favorites Pettibone & Skullphone), a stunning view of Los Angeles, and a cozy, comfortable interior design, although She thought some of the stacks of books (etc) were a bit contrived. Dagny Corcoran, who has recently brought her renowned Art Catalogues bookstore to LACMA, joins Avant-Garde and Soho House members for a wide-ranging conversation on building a collection of art books and ephemera. Topics will include such legendary artist–made books as Dieter Roth’s “Literary Sausage” and the Marcel Duchamp catalogue cover that featured a fake foam breast. Art, books, sausage and breasts! All things We enjoy very much. 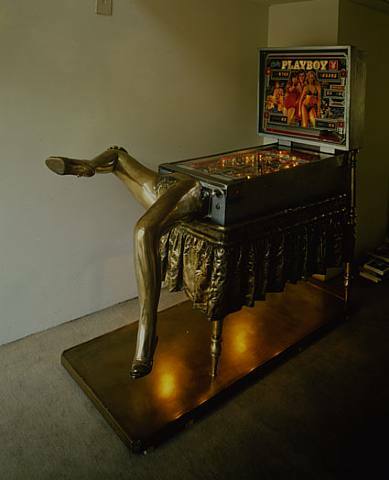 The Bronze Pinball Machine with Woman Affixed Also by Ed Kienholz. Those are a cast of Ms. Corcoran's legs. Think of the body movement of the young men playing pinball in arcades. 1st marriage: One marries for love. 2nd marriage: One marries for security. 3rd marriage: One marries for excitement. After the lecture We had the signature cocktail for the event: Tequila, Agave syrup, Prosecco & orange peel. It was OK, way too sweet for Her and a little too sweet for Him. We decided to stay at the Soho and have dinner on the really lovely balcony. We started with the Cobb Salad and Chicken Liver Pâté, both spectacular. For the main course, She had the Short Ribs and He the Duck Breast, both also spectacular. We paired Our meals with a bottle of Jules Harrison Pinot Noir 2005, that We both enjoyed. 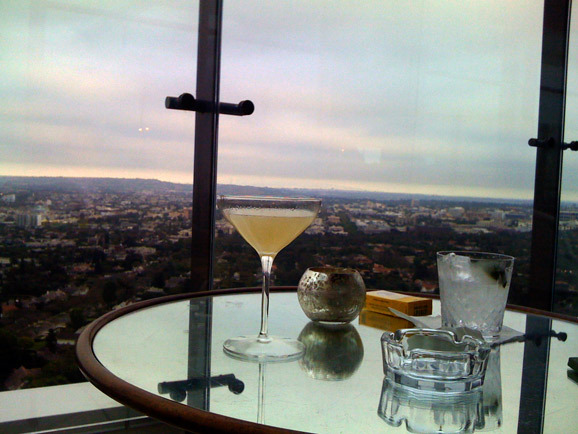 The Soho House has a nice dinner menu, a nice winelist, and very attentive service. The $2000 membership fee is beginning to make sense. We stayed on the balcony laughing and smoking cigarettes after dinner. The Soho House is full of celebrities. The funny thing is that He never recognizes or knows who anyone is. So when a very vivacious, beautiful Latina asked us if the 2 empty chairs next to Us were taken, He was unfazed. He helped the woman move the chairs and then lit her cigarette for her, while She and the Woman had a funny little conversation. The woman and her entourage stayed next to Us for a couple of cigarettes before thanking Us and returning to their table inside. He asked Her, “Was that Penelope Cruz?” To which She replied, “No, darling, that was Salma Hayek…I thought I saw her earlier dining with Harvey Weinstein” Sufficed to say, if He doesn’t recognize a fairly well-known actress than he doesn’t know a Weinstein from a Goldwyn or a Mayer. Tags: art, books, famous people, LACMA, Soho house, that one woman from that one movie, who was that?